Well Bill [Hughes] and I hauled most of the equipment over to Thornton Hall, as Bill had gotten permission to set up a station in basically a large closet on the upper floor of the EE wing. We put a 14AVQ antenna up on the roof of the EE wing. It was sort of back where the roof line breaks and at that time there was a 60 kHz loop antenna there for picking up WWVL that was hooked to a Hewlett Packard 10 MHz precision Crystal Reference Unit – The most accurate frequency source since the physics department had a coax run from the physics building across to the EE equipment lab for get their frequency standard. I recall operating somewhat out of that hole.. I am not sure if we have gotten the Drake TR4C while we were still in Thorton Hall. 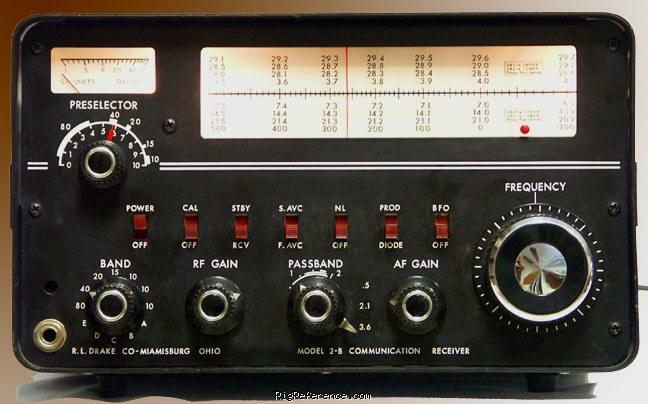 I recall playing with the HRO receiver though. 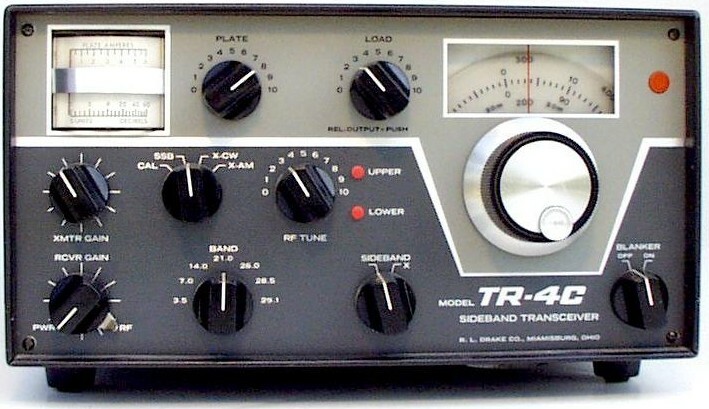 I guess that went on for a year before we moved everything to Peabody hall and got the Drake TR4C transceiver. and the SB 220 linear. 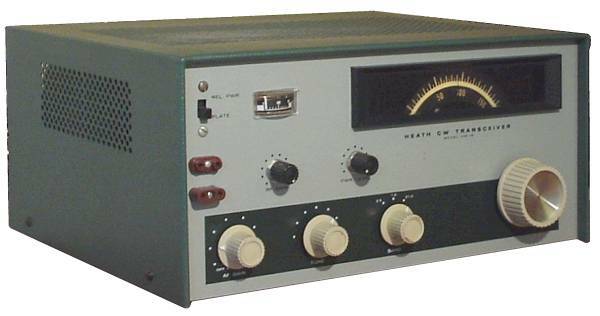 Other gear operational there in the early 1970s included a DX100 used for RTTY (Barry WA2QMI was sort of behind that operation,) There was a rack mounted GE Prog Line for 2 meters. The club auctioned off a lot of the old radios to raise funds. Among the members back than were Frank (Gilbert) Duvall (WA4CWM) [who lives in Fredericksburg), Jay Jackson (then WA4AJF now W4VG), Jon Hall (WB4MMV), Barry Gershenfeld (WA2QMI), Biff Franks (WB4PMG) and Paula (WB4VGI), George Martin (An astronomy graduated student – and do not recall his call), Jim Morgan (then WB4QEB). Somewhere I have a photograph of many of the group when we operated Field Day from Gloucester Point (on the water in a cabin Jim Morgran’s parents owned in 1975). I guess the first President when the club got restarted back ca 1971 was Bill Hughes. But I cannot recall his call sign. We now have pictures of the 1977 Field Day of the UVa ham club at Gloucester Point! View them here. Some of the members convinced the EE department that the honorary EE fraternity’s (Delta Epselon?) club room on the mezzanine of Thornton Hall would be a good place for the ham club. That is when the trouble started!! The first thing to be done was the erection of antennas. The Magnolia trees in the court yard looked like ideal antenna supports. Unfortunately, these were the pride and joy of the chairman of the department and when some of the limbs got broken during the antenna raising, all HELL was to pay and the antennas had to come out of the trees. We ended up with wires strung along the roof. The next thing to cause some difficulty was the EE department computer, an HP 3000, which kept crashing. The club got the blame for these incidents because we were just below the computer. It didn’t matter that during some of the crashes there was no one operating at the time, the club still got the blame. We obviously had to find a new location! The next location for the club was in the basement of Peabody Hall. This was the original UVA ham station location back in the 1930s and there was a route for coax from the basement where the station was located up to the attic. Unfortunately, there had been a major fire in the building and most of it was boarded up. There was no access to the attic. Plans were also in the works to restore the building and so we knew this would only be a temporary club station. Another problem with this location is that it is part of the historical campus and hence any modifications have to go through the Historical Commission in Richmond. Needless to say, putting up antennas was not considered esthetically enhancing. We were limited to invisible wire antennas strung to nearby trees. If the Historical Commission had ever seen them they would have had to go. They worked all right but we were not a power house when it came to DX and sometime could just be heard on the Va Sideband Net. Still another difficulty we had at this location was that there were RFI problems with the record players next door in Newcomb Hall. 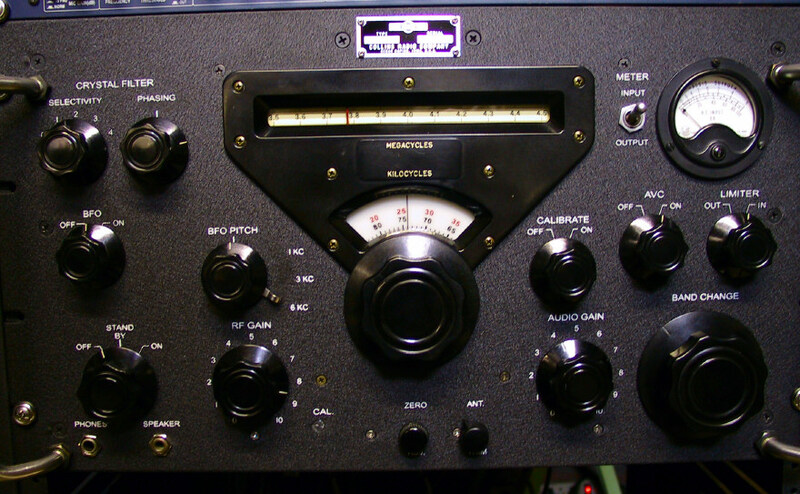 When the ham station was operated, it came in very clearly on the old amplifiers that they were using. Our remedy was to have other hams occupy the listening rooms when someone wanted to operate so that the people listening would not complain. This of course made it difficult to operate since you had to have a team in order to operate! After a few years, they finally got around to the renovation of Peabody Hall and the club was again on the look out for a new place to set up its equipment (1979). After much searching a member of the club discovered that the University had acquired an old farm house on its North campus that was being used for other clubs to meet in. Although this was an inconvenient location, students had to take the bus to get there, we had the whole second floor of the old farm house to set up the stations. In addition, this was not part of the historical campus and hence no antenna restrictions. The second order of business was to put up a tower, donated by one of the students [correction: a Heights 48′ tower sold to the club by member Jim Worthington AD4J] and a triband beam donated by another student [correction: TH-6DXX purchased new by the club]. What could go wrong? Shortly after the club got on the air, we got a frantic call from the Ivy Gardens Apartments, just up the hill, that we were wiping out their cable television system. It turns out that the club station was being picked up on all of the TVs in the complex. After checking out our equipment thoroughly with borrowed UVA equipment, we knew that we were only radiating what we were supposed to be radiating. This of course did not convince Covey TV, who maintained the system and so they called in the FCC. After several months of letters back and forth to the FCC, Covey TV was convinced that it was the cable TV equipment that had a problem and then Covey ordered, from the company that manufactured the cable TV equipment, the needed filters. This took care of the problem and many happy days of operating followed. Unfortunately, a couple of years later (1983 or so) the University decided that the old farm house sat on an ideal location for some new dormitories. The club was on the hunt again for a station location. In graduate school, however, there was a ham club and, most importantly, a ham station at the University of Virginia (W4UVA). There weren’t too many hams around, though, and the club station was largely unused (I used to go up in the evenings to QNI some cw nets and was often the only person there). The station was in its own house on the university grounds and it was a darn good setup — a Ten-Tec on IV and some *real* antennas (unlike the “temporary” kind I have had since then). 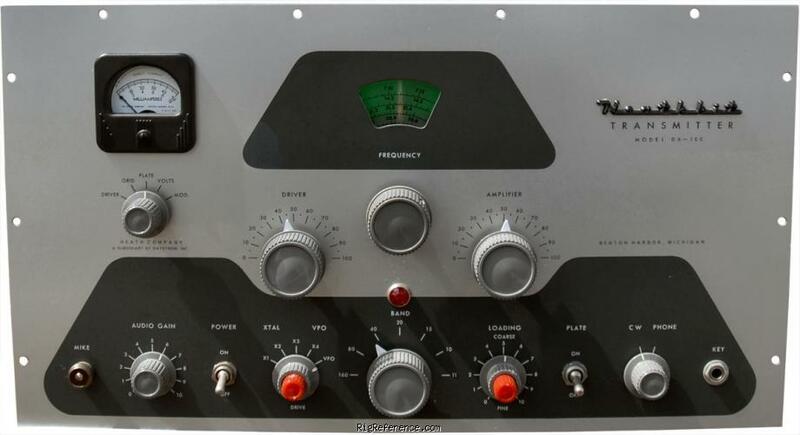 The shack on Massie Road was a great place…Those old Ten-Tecs are known for outstanding CW, and our Triton IV was no exception. At the time, the UVa club had not yet re-aquired the W4UVA callsign, and was then known as WB4DZL. Note on the back the comments about getting together with the guys from VT. This is a tradition that has also been re-started between the two clubs recently, with our twice a year foxhunts (alternating campus locations). 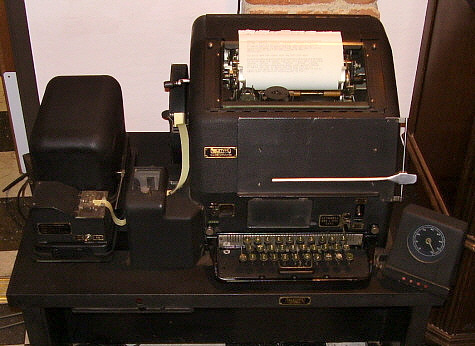 Also, note the “Xmtr”, the Drake TR-4C, as pictured above! And courtesy of Glen Allen, W4GKA (formerly KQ4Y and WD4KIS) and Jim Worthington, AD4J, we have a pair of W4UVA club cards from after the W4UVA callsign was secured (again?) for UVa club use! The W4UVA callsign was obtained for UVa by Phil “Pip” Sager, WB4FDT, in 1975. And here’s the W4UVA club license from 1976, with the Peabody Hall shack listed as address. To see an old club roster from this time period, and a letter to Lee Moyer explaining the club status, click here. We know from Jim Worthington, AD4J, that for some of this period, a Dr. John Updike (mentioned in some of the letters to Lee Moyer) was faculty adviser to the club. 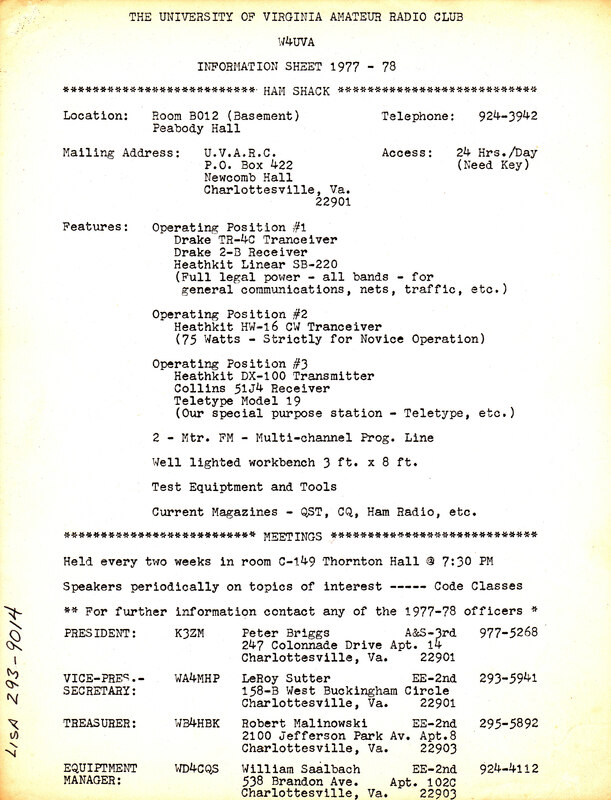 Peter Briggs, K3ZM, past president of UVARC, has provided us with some additional information from the 1970s group. In the fall of 1975, the UVARC president was Gilbert DuVal. Prior to him, Jim Morgan, WB4QEB (now W4QE) had been president. Biff Franks, WB4PMG, came after Gilbert, and Peter Briggs was himself president from 1977-1979. After Peter came Glen Allen, and some time after Glen came Ken Keysear (now W4KK). And finally after Ken came Jim Mankin. Some of these names can be seen on the club roster of the above link. When I showed up on the scene, the shack was in the basement of Peabody Hall and the call was WB4DZL…Peabody Hall had been damaged by a fire a year or two earlier and wouldn’t be renovated for years (at which time they kicked us out, of course). On the roof we had a 14AVQ with maybe a few radials (!) and a ridiculous long-wire antenna that originated in the shack (in the basement of Peabody) and had an effective radiated power in the single digits, probably. We had, I think, a TR4C XVCR and a Heath SB-220. There was an HW-16 novice station as well, and a third station with a Heath DX-100 and a Collins 75A4 (cool!). A year or two later, we hung inverted vees off a catenary rope dropped from the peak of the gabled roof (that ran toward Newcomb Hall) for maybe 20 and 15 meters. I was unimpressed with the efficiency of the 14AVQ. We also fashioned improved end-fed horizontal antennas on the two flat roof balconies on either side, with a tuned matching circuit at the feed point – these were for 80 and 40 meters. The improvement in performance of all these HF antennas was stunning. We actually then worked tons of DX. I worked lots of EU’s on 80, for example. We later traded in the Drake XCVR for a Ten Tec Triton IV, which we all loved. Also acquired a Q multiplier for one of the side stations to match the Drake 2B which I had not mentioned. For most members who were there when I arrived, the heart of the shack was an old 2 meter FM transceiver (tubes, with 6146’s in the finals, I think). This radio constantly monitored the local repeater (16-76, it seems to me). I even used it myself when I was in the shack to talk with other members locally. By now you may have gleaned that I was a DXer and contester, while most of the folks who were here when I arrived were VHF-ers. Jim, AD4J and Glen, W4GKA were exceptions. We and others helped effect the improvements already cited to the HF setup. After we got kicked out of Peabody Hall, Glen Allen W4GKA found us a new home above Ivy Gardens on a hill and he also led us to getting up a tower there. I will let Jim Worthington and Glen relate all that. Another bit of history is that we always clobbered the “listening rooms” at Newcomb Hall, where you could go to check out a record (a vinyl audio (analog) recording medium) and play it on the stereo (actually, I’m not even sure they were stereos! let’s call them hi-fi’s) in Newcomb Hall. I believe there were two listening rooms. I even used one once myself. Well, we finally solved that problem. Indeed, got everything working great until it was time to renovate the building. As Peter said, the club was mostly interested in 2 meter FM when we got involved. The main use of HF was to check into the Virginia Sideband Net to send and receive messages for students. Long distance calls were relatively expensive then, so the club put out boxes in Newcombe Hall and elsewhere for students. They could drop handwritten messages in the boxes and the club would send them out daily on 75 meters through the National Traffic System. When Peter became the club president, he made a very effective plea for funds to the student council budget committee. This resulted in the allocation of the club needed to build a good HF station. I recall working with Peter to put together a 14 point plan for this. Student Council subsequently cited it as a model of how organizations should request funds. When the club moved from Peabody Hall to the shack above Copeley Hill, it purchased a Hy-Gain TH-6DXX beam and a Heights 48′ tower. This made a huge improvement in the signal on the high bands. Glen Allen transported the tower from Norfolk to Charlottesville with his dilapidated station wagon. I’m sure he can relate the amusing story behind this. The University Heights apartments cable system ran off of a tower close to the club station. During a widely-watched Redskins-Cowboys game, Peter was working DX and combining his signal with the cable feed. Jim is correct about the tower and the TH6. The tower was actually fairly controversial. It was a free standing aluminum tower, and required no guys. This was somewhat disturbing to club members that were used to the guyed rohn towers, because they had several inches of movement at the top. Me, I did not know any better, so I had no problem with it. After we bought the tower from Jim, I picked it up from his grandmothers house in Norfolk. All I really remember about the journey was my Opel Kadett broke down. But that was not unusual or memorable. We did manage to leave the rotator cable in the basement, but were able to find some locally. It seems that most of the QSL cards from the 1970s/early ’80s clubs have been lost (some lost after a submission for DXCC!). Club meetings were held near Civil Engineering on the second floor of Thornton. 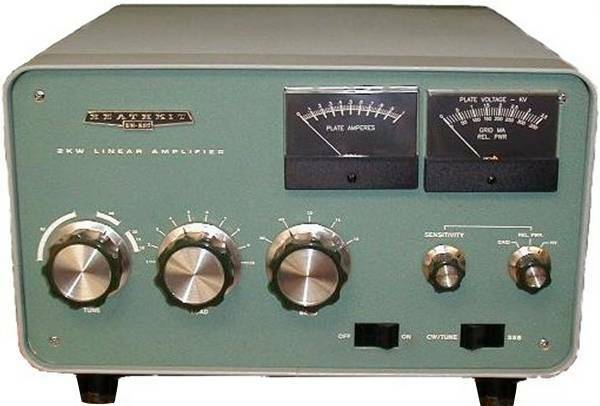 From what we currently know, it seems that the decade of the 1970s and the early 1980s was the highpoint for amateur radio organizations at UVa.